Rokeya Sakhawat Hossein has inspired and changed the lives of many women. A muslim feminist writer and educationalist, she campaigned for equality, peace, social justice, harmony and an eco-friendly world. Born in 1880, in colonial Victorian India in Rangpur, now in Bangladesh, she fought a lonely battle to create a better society and improve the lives of women. She was brought up under very strict purdah and denied the opportunity of education. It was sheer determination and commitment that kept her going despite all the difficulties, barriers, abuse and opposition. For the past five years I have been trying to raise awareness and promote Rokeya in the West. Following the success of a play Rokeya’s Dream (based on Rokeya’s satire Sultana’s Dream) staged in London last year, there was an invitation to visit West Bengal this spring. The production, a joint venture was initiated by Mahila Sangha, a Bangladeshi women’s group (that I Chair) with Rose Bruford College of Theatre and Performance and Tara Arts as partners. A group of three Bruford graduates (Rae Leaver, Claudia Jazz Haley and Alia Wilson) who had worked on the play, the choreographer (Showmi Das) and I went to India in response to the invitation from three Universities and Sakhawat Memorial Government Girls’ High School. The trip was possible because of the untiring efforts of a Rokeya scholar and peace activist, Mr. Prantosh Bandyopadhyay. The warm welcome with beautiful bouquets of flowers everywhere and the love, affection, hospitality and kindness of everyone touched our hearts deeply. It reflected the true spirit of Rokeya. We had travelled 6000 miles and had taken from Britain a message of goodwill, love and peace. We attended the centenary of Sakhawat Memorial School established by Rokeya in 1911 to educate young muslim women. At the time Muslim women did not have access to education and purdah was a barrier. Today, the school boasts as one of the top institutions in Kolkata and is open to students of all faiths and denominations. The march through the streets of rush hour central Kolkata with placards displaying Rokeya’s slogans and the rally and cultural performances by the students were breathtaking. The chief minister of West Bengal and several other ministers were present. So were their alumni from all parts of the globe. It was quite an emotional experience for me as my mother (Anwara Bahar Choudhury) was a student of Rokeya and a former Headteacher of the school. My siblings (Iqbal Bahar Choudhury and Nasreen Shams) had also been invited and they joined me from the US and Bangladesh to attend the event. Our team did a workshop at the school on Rokeya’s messages through dance and movements. The students enjoyed every moment of it. There are plans to link the school with Plumstead Manor School in London. We were indeed very honoured to have the opportunity of working with the students of the Department of Drama, University of Rabindra Bharati and Visva Bharati. The latter was created by Nobel laureate Rabindranath Tagore and is situated in rural Bolpur. The ethos of Visva Bharati is based on Tagore’s philosophy of learning in a natural environment and also linking up globally. It is part of Santiniketan, a unique educational centre for all age groups. The peace and tranquility of rural Bengal can be experienced here amidst the natural surroundings. Rabindra Bharati was established in Tagore’s family estate in the outskirts of Kolkata by the Government of India in his honour on his birth centenary. Our aim at the workshops was to tell the participants about Rokeya’s life and messages, share our experiences of producing the play, Rokeya’s Dream and presenting the western interpretation of her story. At the end of the workshops, and after exploring the ideas, the students had to present their interpretation of the messages in short group performances. Their creativity and innovative talents were stunning. Most of them had never heard of Rokeya and the media picked this up by quoting in the headlines of The Indian Express ‘Britons help Bengal students rediscover one of the early feminist icons of South Asia’. Tagore and Rokeya had many common messages. In some of the performances the students had incorporated Tagore’s work alongside. Rokeya had touched them all. Many of them said that they could relate with her messages when they looked at their own life experiences. The themes are all very pertinent in today’s world. They were deeply moved and inspired and pledged to continue to work on Rokeya. We left the two Universities with the request from the students and teachers to organise further collaborative work and exchange programmes between them and Bruford. With Tagore’s 150 birth anniversary next year, there could not be a better opportunity. Promoting friendship, exchanging ideas and understanding different cultures through theatre can be very powerful and enriching. Theatre as an art form is visual and universal, there is no language barrier. Our final destination was Burdwan University. We were speakers at an international conference on Women and Folk Culture. Rokeya featured in our presentations. Rae Leaver who spoke on behalf of the Bruford graduates said that ‘Rokeya is a role model for British women’. Rokeya has no boundaries. We left Kolkata with tears. They were probably tears of joy. We had experienced so much in such a short time and had been greatly enriched. We had even seen the final resting place of Rokeya and visited a children’s home in Panihati that she had initiated. 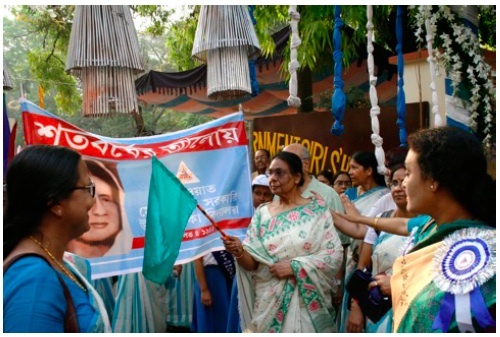 We had made numerous friends, shared our ideas, raised awareness about Rokeya and her messages; established a link for future communication between the centres of learning. East had met West. There is now global interest in the work of our group – The Rokeya Project. These small steps could be the beginning of a wider peace movement that Rokeya dreamt. Salaam Rokeya. Shaheen Westcombe is a member of the GF Executive. Her heritage country is Bangladesh where she trained as an architect. After working as an architect in the UK for about 10 years she moved to community development and worked in management positions in local government in London for 25 years. She was awarded the MBE in 2001 for contributions to community relations.